We’d love your help. 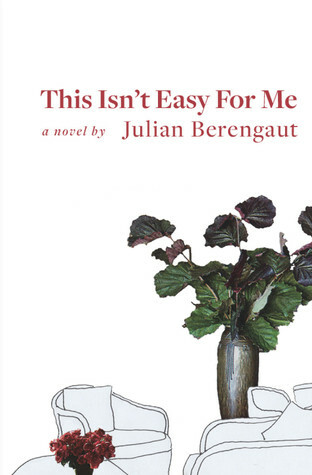 Let us know what’s wrong with this preview of This Isn't Easy for Me by Julian Berengaut. Sabine is a theoretical physicist from Berlin and Renata is a prominent Polish-born American investor. They arrange to meet for the first time in the lounge of a Boston hotel, where Sabine wants to discuss a personal matter. They touch on a succession of topics: quantum gravity (Sabine’s academic specialty); Renata’s strange diet and her famous husband Mark, who’s a mathema Sabine is a theoretical physicist from Berlin and Renata is a prominent Polish-born American investor. They arrange to meet for the first time in the lounge of a Boston hotel, where Sabine wants to discuss a personal matter. They touch on a succession of topics: quantum gravity (Sabine’s academic specialty); Renata’s strange diet and her famous husband Mark, who’s a mathematician; Jewish jokes; high school memories; numerous intellectual figures and ideas; Haiti rescue efforts, Cuban boleros and Frank Sinatra; the Holocaust—and the BRCA mutation that causes breast cancer. But every time they get near Sabine’s personal matter, they meander back into safer currents. Sabine slowly comes to the point: she encountered Renata’s husband in a professional setting and fell deeply in love with him. She propositioned him, but Mark demurred in consideration of his wife, despite her unconventional views on marriage. Ashamed, Sabine determined that his rejection would be the end of the story—except for the intrigue of those unconventional views. Thus, she contacts Renata for answers. Sabine gets more than she bargained for. Renata comes prepared. She knows about Sabine and she has her own agenda which may include bringing Sabine into her family. To ask other readers questions about This Isn't Easy for Me, please sign up. This is a great book for a rainy afternoon. It reads briskly, but it's a complex story, and it's told entirely in conversation, and the dialogue isn't even attributed to the speakers—but it's never hard to follow. The two people speaking are Sabine, a physicist from Berlin, and Renata, a very successful economist from Poland. Sabine calls the meeting so she can confess to how she fell in love with Renata's husband. This is only the basis of their meeting; the conversation touches on so many thin This is a great book for a rainy afternoon. It reads briskly, but it's a complex story, and it's told entirely in conversation, and the dialogue isn't even attributed to the speakers—but it's never hard to follow. The two people speaking are Sabine, a physicist from Berlin, and Renata, a very successful economist from Poland. Sabine calls the meeting so she can confess to how she fell in love with Renata's husband. This is only the basis of their meeting; the conversation touches on so many things, like what each of their families did during the holocaust, how Renata saved the life of a girl from Haiti and adopted her, what the BRCA gene (which has been much in the news lately) means to them. These erudite women recite great literature in many languages, recount fascinating stories from the lives of intellectuals like Gödel and Diderot and Goethe, and become an example of the sort of civility we should all aspire to. I needn’t have worried. The two women’s voices are sufficiently distinct that I knew who was talking without I came to this novel with a certain wariness. For one thing it is written entirely in dialogue, which in itself is not an easy thing to pull off and further complicated by not having any dialogue tags or chapter breaks. For another, the two people talking are women and the author is a man. On the other hand, it had been praised by Jen Michalski, an accomplished author herself and a friend. A book length conversation of only dialogue with no speaker identifiers sounds overly academic and geared primarily towards experiment, but Berengaut actually manages to pull this off as a narrative. Not just narrowly either, but well. I always knew who was talking. The characters were highly developed and their thought and speech patterns were individualized and quite distinct. Beyond that, it still told an engaging story. I'm impressed, highly impressed. Engrossing narrative consists entirely of a fascinating conversation between two women. Like all good conversations, the dialogue wanders between unexpected topics, amusing trivia, revealing personal details and plots twists. Read it in one sitting if you can.